Cafe World Cheats — Use Top Secret Cheats and Tips To Boost Cafe World Instantly! Use Top Secret Cheats and Tips To Boost Cafe World Instantly! Chocolate Macadamia Nut Pie crushed Peanut Butter Pie with 60% of the vote. It will now go onto the next round for a chance to be cooked in the game in a battle against pies rival: Cake! Which pie should win the third race in the Pie division? Vote here now in this Round! Cafe World Halloween items has arrived! Create some fantastic and frightful fun in your café! Check out all the new limited edition items and design your own haunted eatery now! New stove and counter Ten over Six Stove and Tea Cup Counter. New table and chair Teapot Table and Tea Cup Chair. Here are new gifts: Tea Party Drink Me Elixir cafe world released today, just share them with your friends. Tea Party: Instant servings, and customers will pay 25 coins each! Drink Me Elixir: Instant servings, and customers will pay 35 coins each! Here is new gift: Tassimo Coffee cafe world released today, just share it with your friends. Tassimo Coffee: Instant servings, and customers will pay 10 coins each! 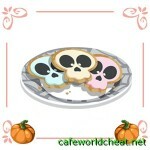 Here is new gift: Skull Cookies cafe world released today, just share it with your friends. Skull Cookies: Instant servings, and customers will pay 25 coins each! All other trademarks are the property of their respective owners. This site and report is in no way affiliated with or endorsed by Zynga, Inc.